Wyoming (2-3, 0-1) is coming off a loss to Boise State in their home opener. Unfortunately, it was really never a competitive football game and Boise controlled the game from the get go. Hawaii comes into the game at 5-1, 2-0 having beat San Jose State in overtime last week. Davis Potter, the new Pokes beat writer for the CST joins us this week and will be taking over for Brandon Foster. What are your thoughts on last week’s game against Boise State? Pretty much a microcosm of what we’ve seen most of the season — inconsistent offense and a defense that got wore down as the game went on and gave up too many big plays. The Cowboys got soundly beat by a better team. Nice to see senior running back return from bruised ribs on Sept. 1 with a 75-yard touchdown run and 141 yards on 12 carries. Not a player, but I will go third down. In a nutshell, Wyoming is awful converting third downs (31.4 percent) and not good defending on third downs (44.4 percent). This has to get better if the Cowboys have any chance at Hawaii — or in any game the rest of the season. It moves the chains, possesses the ball and can score more points, and the defense doesn’t allow too many big plays. Wyoming left a lot to be desired last week. Boise is a good team and I’d be surprised if the Broncos don’t win the Mountain West this season, but Wyoming wasn’t even competitive for most of that game. It’s not surprising that the offense is struggling outside of Nico Evans given some of the youth (and injuries) along the offensive line and at quarterback, but the Cowboys’ defense isn’t performing the way it should with eight starters back from what was one of the best defenses in the league last season. The defense is playing a bunch of snaps with the offense not sustaining many drives, but Boise had 24 points in the first half. The Cowboys have to play better on that side of the ball. Evans came back from his rib injury to go for 141 yards and a score on just 12 carries. He’s proven to be by far the most consistent weapon for Wyoming’s offense when healthy. Granderson was a pass-rushing force off the edge last season with a team-high 9.5 sacks, but he’s yet to find that form through five games. He got his first sack last week, but with Hawaii likely to throw it 40-50 times this week, this is a chance for Granderson to affect the game and build some confidence at the same time. they win the turnover battle and get another big game from Evans. Given what the defense is about to face with the way it’s played so far, Wyoming’s going to have to score some points. Getting some extra possessions would help, but Wyoming has forced just six turnovers so far this season. Last week against Boise State was the last thing the Cowboys wanted. The Cowboys were looking to come out and take advantage of a Boise State team who they beat in Laramie two years ago in thrilling fashion, and propelling them into the Mountain West title game. Instead the game quickly became a blowout in favor of the Broncos. The Broncos offense, led by Brett Rypien was just too much for the Cowboy defense to sustain while the Cowboy offense was stuck in neutral for most of the game. Quarterback Tyler Vander Waal had a decent game, however, it doesn’t feel like the gameplan has been tweaked to make him a more effective quarterback. 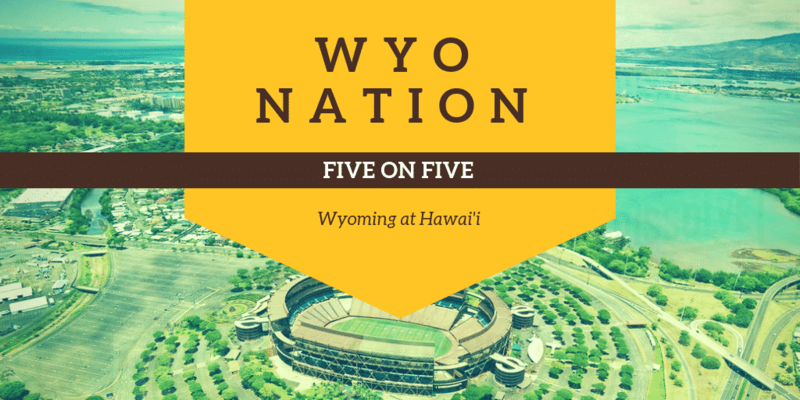 Several freshman and redshirt freshman quarterbacks have had success at Wyoming but the offense just can’t sustain drives at this point. Many reasons why they’re struggling, but one thing is for sure, if it doesn’t change quickly the Pokes will be at the bottom of the conference in short order. Nico returned after being out for a couple weeks due to injury and he put up another 100 yard+ game for the Cowboys. He’s one of the shining spots of the Cowboy offense so far this season. Nico had a 75 yard run for a touchdown to open the second half last week, giving the Cowboy offense a tiny spark to keep the game from being a total rout. The Cowboys will be facing a Hawai’i offense that’s as potent as they come. Not only that, the Rainbow Warriors have been a very tough out on the island so far this season. The Cowboys need to be prepared to face an air raid offense that’s been mostly perfected by Nick Rolovich. That being said, the Cowboy secondary is my Poke Pick this week. They’ll all need to be on their toes to keep Cole McDonald at bay at least somewhat. Everyone has a large task in front of them, and keep the Bows from flying all over the field is task number one. Wyoming will win this game if they can stuff Cole McDonald and force the ‘Bows into running the football. The Cowboys will also need to find a rhythm on offense and start figuring out a way to sustain drives and get points on the board. That has been a challenge for the Cowboys so far this season. They rank among the bottom third in many offensive categories. If the Cowboys have any chance to win this game it’s putting points on the board. Hawaii is the type of team who can and will get you into a track meet and match you score for score, and the Pokes right now cannot match that. The defense has been too inconsistent this season to keeps the ‘Bows at bay. The disappointing thing about last week is that the Cowboys were really never in the game. I don’t think many expected the Cowboys to win but did expect them to be competitive. Now the key is for as many of the players said in the post-game press conference to not let Boise State beat the Cowboys twice. Evans was back from injury and had 141 yards on 12 carries and now has 420 rushing yards on the season in just three games. Evans is by far Wyoming’s best offensive player and he will have another productive game this week. They can outscore Hawai’i. I have serious doubt they can because the passing game for Wyoming is among the worst in the country. The good news is Hawai’i ranks 111th in pass defense giving up 279 yards per game. If Tyler Vander Wall and his receivers can’t get the passing game going against Hawai’i chances are they will not get it going against anybody. It was disappointing that the Cowboys failed to compete. Boise was clearly the better team and controlled the game from the start. I will say I personally saw growth in TVW and I think he continues to get better. Wyoming is through September and it was brutal. I will be interested to see how they stack up against their remaining competition. I don’t know who else would even be considered for this. I am still waiting for these guys to take over a football game like they did week 1. They cause 3 turnovers and win third down on both sides of the ball.